Hit the road this summer with the fastest helmets on the market, researched and developed by Limar, the Helmet Specialist! With comfort and performance as its constant goals, Limar plans and designs each of its helmet lines to guarantee excellent performance and exclusive style to cyclists around the globe. When you're racing against the clock, Limar helmets simply cant be beat. Both styles, the Speed Demon and Crono, feature Limar's In-Mould production process, allowing for a great reduction in helmet weight while ensuring tremendous impact resistance. The Super System 2 micrometric sizing wheel is light and easy to adjust quickly for a perfect fit. The Cool Comfort soft pads inside each helmet are ergonomic, anti-allergic, and absorbent, while the specially shaped airflows are equipped with an insect net to help keep your head cool. 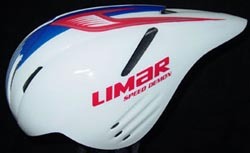 Through a series of studies, Limar developed its long-shaped Speed Demon helmet in order to provide the most efficient aerodynamics and comfort available to today's cyclists. This helmet's flexible ear coverage reduces noise and wind resistance, and its remarkable 15 air vents have internal channels that allow for excellent airflow. The helmet fits heads between 54 and 61 centimeters (approximately 21 to 25 inches). At 345 grams, the Speed Demon is extraordinarily lightweight, and available in three cool colors (Carbon, Silver, and White) that suit any style. MSRP: $199.99. With its low weight (330 grams) and fantastic finish, the Limar Crono helmet has five internal air vents and a compact design developed specifically to offer aerodynamic advantages to all riders. These amazing helmets are wind-tunnel tested and UCI approved. The Crono fits heads between 53 and 59 centimeters (approximately 20 to 24 inches), and the helmets three sharp colors (Carbon, Silver, and White) guarantee you'll ride the roads in style. MSRP: $169.99. For more information about Limar Speed Demon and Crono race helmets, please visit your favorite bicycle dealer, or contact ProNet Cycling at (800) 279-3793 and info@pronetcycling.com. Visit us online at www.pronetcycling.com. Limar Helmets are the Perfect Choice for Road and Mountain Bike Riding! Ride back to school in style with Limar kids, youth, and sport action helmets!